In an unprecedented joint crime prevention project, the I-Team and Telemundo 47 Investiga sent surveys to hundreds of convicted robbers in New York and New Jersey, asking them questions about how they picked their targets and what you can do to avoid becoming a victim. The answers from behind bars were eye-opening. See the latest stories in this four-part investigative series below. In an unprecedented crime prevention project, the I-Team and Telemundo 47 Investiga sent surveys to hundreds of convicted robbers in New York and New Jersey asking them questions about how they pick their targets and what you can do to avoid becoming a victim. Sarah Wallace reports. Mayco Castro is serving a 9-year prison sentence for handcuffing, pistol-whipping and robbing a man in the hallway of an apartment building in 2013. 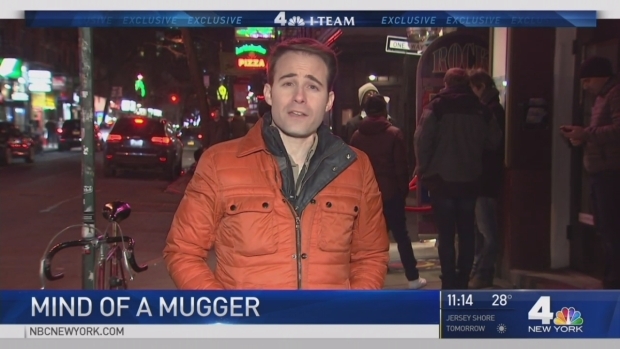 Castro said he shadowed his victim for a week before he robbed him and an I-Team survey sent to the most hardened muggers and street robbers in New York and New Jersey shows this is common. Convicted muggers also said they sought to distract their victims before robbing them and didn’t care if they were caught on surveillance cameras. Chris Glorioso reports. Convicted muggers reveal what they would tell their mothers to avoid being targeted. Sarah Wallace reports. Convicted muggers reveal tips on how to make yourself less of a target on the streets and the subway. Chris Glorioso reports.